Pies are quite seasonal; apple pies are best enjoyed in autumn, mince pies with Christmas, and banana cream pies in the summer. 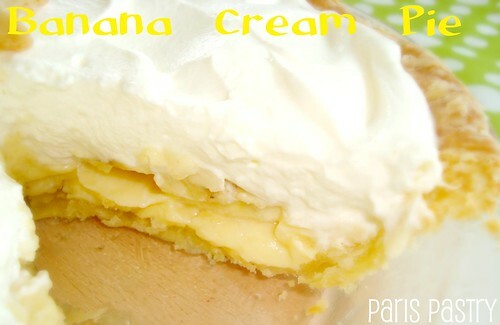 There's just something about banana cream pies that makes them so perfect for summer ♥. The fruit, the cream and its overall lushness. I’m always amazed at how fresh a banana cream pie taste; usually, pies are so sweet and warming, but this pie is light and cooling. My go-to food when lounging by the pool. Rating: 3.5 out of 5. - Make the crust: Preheat oven to 425 degrees. On a lightly floured work surface, roll out dough into a 14-inch round (¼ inch thick). Fit dough into a 9-inch pie plate. Trim dough to extend above edges by 1 inch, fold under, and crimp. Prick bottom with a fork, and freeze until firm, about 15 minutes. Cut a large round of parchment paper (about 11 inches), and place in pie shell, allowing excess to extend above edges. Fill with pie weights. Freeze until cold, about 10 minutes. - Bake crust 15 minutes. Reduce oven temperature to 375 degrees. Remove pie weights and parchment, and bake until golden brown, about 20 minutes more. Let cool on a wire rack. - Make the filling: Combine granulated sugar, cornstarch, and salt in a bowl. Add egg yolks, and whisk until smooth. Bring milk to a simmer in a saucepan over medium heat. Add ½ cup milk to yolk mixture in a slow, steady stream, whisking constantly. Pour mixture into pan with hot milk, and cook, whisking constantly, until mixture begins to bubble and is very thick, about 6 minutes. - Pour milk mixture through a large-mesh sieve into a bowl. Add butter, and stir until melted. Fold in bananas. Pour into crust. Place plastic wrap directly on surface of filling to prevent a skin from forming. Refrigerate for 2 hours. Make the topping: Beat together cream, sugar, and vanilla until soft peaks form. Spread whipped cream over filling. Using a rubber spatula or the back of a spoon, shape topping into peaks. half of the pie. Not a bad thing, I assure you. this must be a fantastic treat for the kids! How I wish I enjoyed bananas other than in banana bread right now! This looks great...especially with all that cream!! Ooooh, looks so beautiful! Especially with the little stars on top! 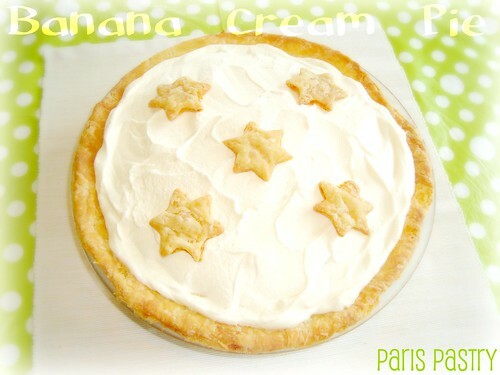 I've never had a Banana pie ... looks delicious .. and I love bananas! YUMMY! I love banana cream pie. I just had a banana pudding cupcake at Dimples Cupcakes on Friday. It's put me in the mood. I will have to check out this recipe. Like many other baked goods, I used to hate cream pies as a child because I'd been scarred by some bad restaurant ones. But made correctly with not too much sugar and a good portion of fruit, they are the perfect cool summer treat. Yours is beautiful and the pastry stars are too cute. My goodness - this looks divine!!! It's not summer here at the moment but who cares - lovely - will give it a whirl! Looks so delicious and cute with the stars on top. 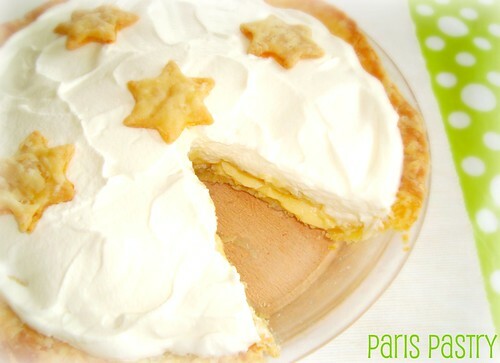 I've never ate a pie/tart featuring banana (eg. banofee pie or banana cream pie etc) but it sure does sound like a heavenly combination. Plus, I love your little star decorations on the top. Bien fait! I just found your blog on Google Reader and now I am following your delicious site. I hope you will stop by mine too. I post some recipes but haven't quite grasped how to add tabs or categories to that I can do just a recipe file.